The 49mm 98-UVAT UV Filter is one of Chiaro’s highest-rated protective UV filters with 98% light transmission. It’s ideal for photographers who demand high-quality glass and other essential features for excellent image fidelity and construction. To achieve 98% light transmission, Chiaro uses highly-polished optical glass, multi-coating, and additional advanced elements that improve the filter’s light transmission. Resistance coating improves the scratch resistance of the glass, and helps assure that water, oil, dust, and fingerprints are removed with a gentle wipe. 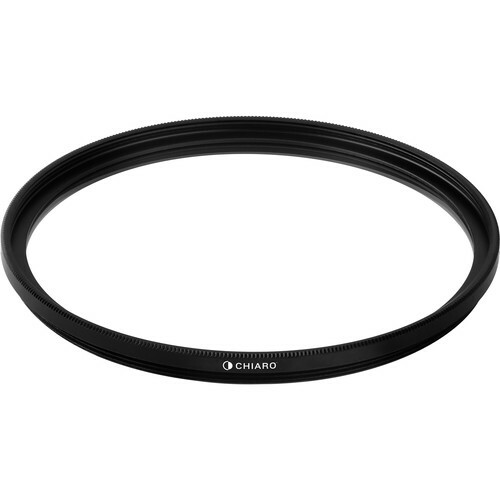 A hard-anodized aluminum filter ring is designed to screw on and off effortlessly, and it’s thin to prevent vignetting when used with wide-angle lenses. 49mm 98-UVAT UV Filter is rated 4.7 out of 5 by 17. Rated 4 out of 5 by P from Sigma 85 Art Equipped on my Sigma 85mm f/1.4 Art, and it performs almost the same as other UV filters that I have (Hoya HMC Super UV(0), Formatt Hitech Firecrest UV MC Superslim). There is a very slight loss in image quality at the pixel-peeping level ( this is very common on all filters of any kind inserted on your lens) although unnoticeable. Light transmission seems ok, I did not notice any difference of slowing of shutter speed when shooting Aperture priority mode in low light.? Although, this is my first filter made in China and it is not known for best in making glass filters and lenses but for the price at 86mm, I am satisfied with my purchase. Rated 5 out of 5 by David from Clear Very nice quality. So clear so as to make you wonder if its even there. Rated 5 out of 5 by George from Had Not Heard of This Brand...Works Very Well Had Not Heard of This Brand...Works Very Well. Beautiful glass...and I like the sound of the brand name...Chiaro. Rated 4 out of 5 by Harry E. from Very nice filter. The filter is nice and thin, fits well and was a nice price. Rated 5 out of 5 by MarioD from It works There isn't much you can say about a UV filter.? This fits my Canon lens perfectly.? I always buy a UV filter for my lens as it protects the lens not only from UV rays but also any possible scratches I may get will walking through forests and brush. Rated 4 out of 5 by Anonymous from It is, what it is. UVAT filter is manly to protect the outer lens. However, I did a test with and without the UVAT lens to see if there is any difference. Moderate improvement with the lens versus without. Like I said, manly for lens protection. Rated 4 out of 5 by Ronald from Nice Filter This filter has so far worked well,? I'm glad that it seems to let in lot's of light, is easy to clean, and has a very low amount of dust build-up due to static electricity. A very nice filter for the price! Rated 5 out of 5 by Cinde from Lens protection is a must! The Chiaro UV Filter has saved my 18-400mm lens from numerous dog nose and tongue smudges. I believe it has also kept the lens from fogging on very cold days. The picture quality is not at all compromised. Does this fit the Canon EF 50mm f/1.4 USM Lens?